If you haven’t yet registered for the US Go Congress in Williamsburg VA this year, you have until May 31 to take advantage of the Early Bird registration discount. On June 1 the cost goes up by $50 per person. To get the discount it is necessary to register and make a minimum payment of $70. 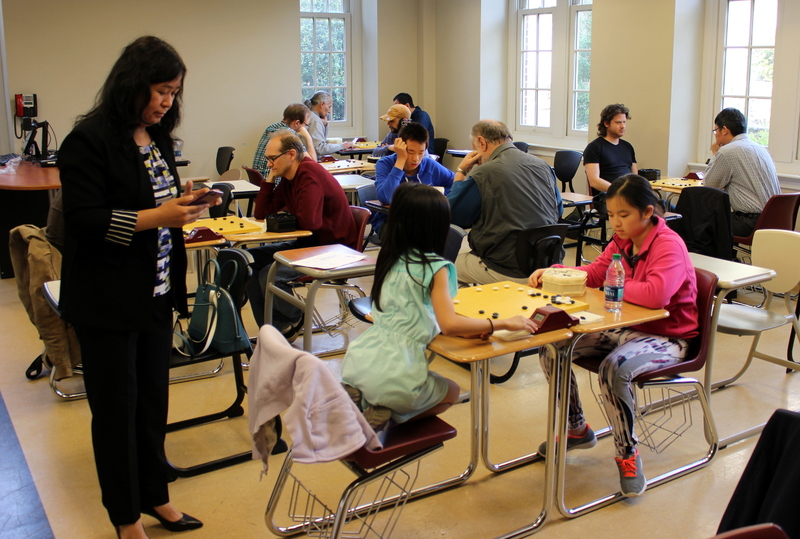 The U.S. Go Congress runs from July 21-28 and features a full week of go-related activities. 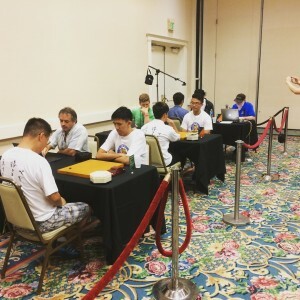 Register now and reserve your spot in the premier annual event of American go. 很荣幸能在这里欢迎各位来到第 34 届围棋大会。第34回USコングレスへようこそ。This is the opening line in US Go Congress Co-Director Diego Pierrottet’s welcome message, which, for those who don’t read Chinese or Japanese, is “It’s my pleasure to welcome you to the 34th Annual US Go Congress.” The wealth of information available each year in the Congress attendee booklet has been a challenge for those who do not read English, but with the new Congress mobile app — available on both iOS and Android devices — not only will more information be available, it’s now being provided in multiple languages. The Congress app can be downloaded here. Congress registration is ongoing and still available at the Early Bird Discount price. The 2018 Congress will be held in historic Williamsburg, VA from July 21-28. Registration is still available for Congress at the Early Bird discount price. You can also keep up with Congress goings on by downloading the free mobile app for iOS and Android devices. The American Go Foundation (AGF) is increasing funding for young people attending the US Go Congress, and is also creating a new set of scholarships for college students. Traditional amounts for kids and teens under 18 were $200 for participating in any of the main AGA online youth events (Redmond Cup, National Kyu Championship, Girls Tournament), and an additional $200 for writing an essay. This year, as there is no Go Camp, the board decided to increase the essay scholarship to $300. To apply for the scholarship, read the information here, and then send your essay in by email. 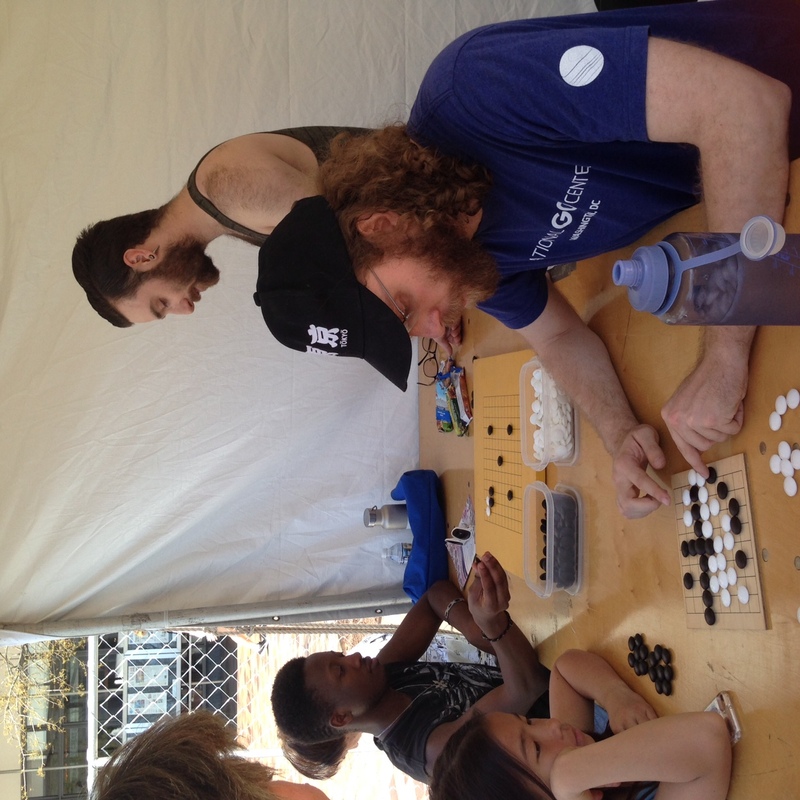 If you played in the youth events, and want your participation scholarship, email your request to youth@usgo.org. For the new college scholarships, participants must be 26 or younger, and actively enrolled in college. Graduate and under graduate students are both eligible, click here to apply. All scholarships are first come first serve, with 20 allotted for the US, and 5 allotted to be split between Canada and Mexico. – Paul Barchilon, EJ Youth Editor. With many activities to choose from in the Williamsburg area, the organizers of this year’s US Go Congress have negotiated discount rates for two of the most popular: Colonial Williamsburg and Busch Gardens. These group rates are available for July 25, the traditional Wednesday ‘Day Off’ at the mid-point of the Congress. Colonial Williamsburg is next to the William & Mary campus, and shuttles are being arranged for Busch Gardens. 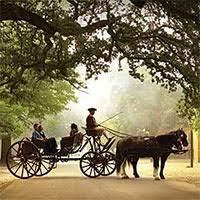 Colonial Williamsburg is the world’s largest living history museum. Step back in time to the 18th century to the dawn of America. With historic trades and sites, two art museums, and interpreters recreating real historic figures, it is a great experience. Enjoy relaxing carriage rides or a sojourn to one of the four taverns. 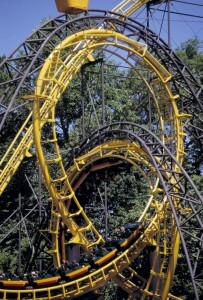 Busch Gardens is a 383 acre theme park with rides, roller coasters, animals, shows, and special events. Experience family-friendly performances on outdoor stages or even enter a world of virtual reality with the Battle for Eire ride. 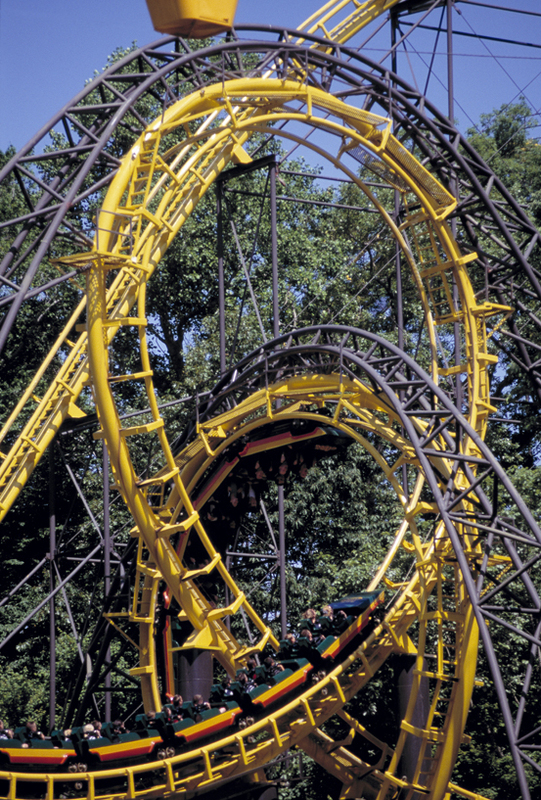 Busch Gardens – $59 (ages 10+) and $47 (ages 3-9) regular rates $90 at gate or $70 online. 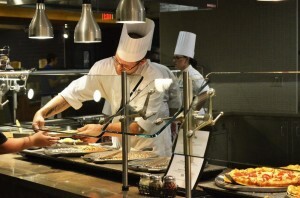 “These are great venues to relax and enjoy for a day between all the other great events at Congress,” says Congress event organizer Yuan Zhou reports. 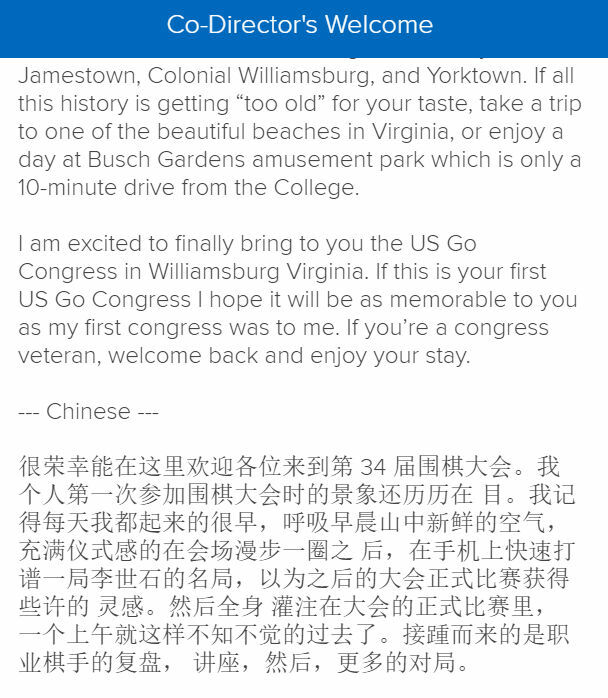 “Come and enjoy all Williamsburg has to offer!” You can sign up now when you register and also learn more about events on the “Videos” page of the Congress mobile app . By registering for Congress now you can get the additional “early bird” Congress discount in addition to saving on event tickets. 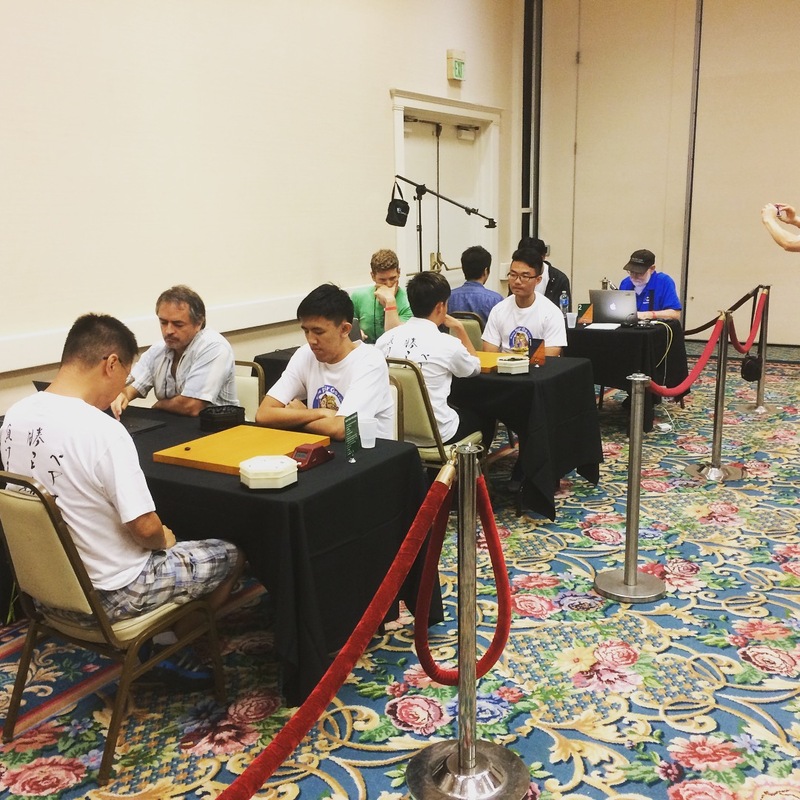 Taipei’s Yi-Tien Chan leads the 2018 World Amateur Go Championships, with a 6-0 record and just two rounds to go. China’s Chen Wang, Korea’s Sangcheon Kim, Singapore’s Jie Hui Kwa, Hungary’s Csaba Mero and Poland’s Stanislaw Frejlak all have five wins each. Aaron Ye (right) of the U.S. is now ranked 23rd at 3-3, while Mexico’s Jose Abraham Florencia Islas is 4-2 and Canada’s Yongfei Ge is also 4-2. 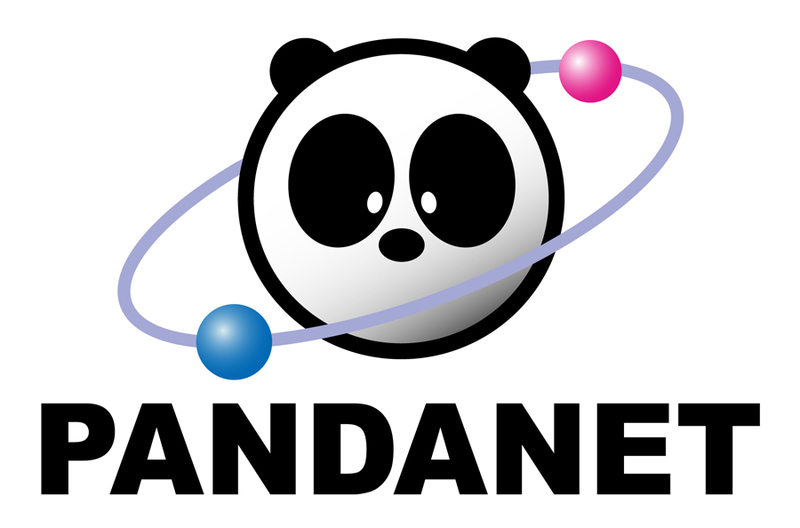 Latest reports and scores are on Ranka Online, including interviews with Thiago Shinji Shimada Ramos of Brazil, Torben Pedersen of Denmark and Ólafur Sigurðarson of Iceland. Have you thought about running a go tournament in your area but weren’t sure where to start? Or have you run tournaments and would like to hear from other experienced TD’s about how they publicize and manage these events? A new workshop at the U.S. Go Congress this July is meant for you. Topics to be covered include basics, like how to run your first tournament: handicaps, AGA membership requirements, handling ranks, pairings, and reporting. Also covered: publicity and pre-registration; regulations, code of conduct, registration management, conflict management; pairing systems - Swiss, McMahon, round robin, knockout, self-paired, etc., and the reason for choosing one pairing system over another; computer pairing and reporting programs. There will also be Q&A with experienced TDs. Rubenstein reports that “We already have the schedule in the Congress mobile app, and will put descriptions for each session there so you can choose to come to the whole workshop, or just the topics of most interest to you.” Congress registration is open now covering this workshop and all the tournaments, pro lectures, and events in Williamsburg VA this July 21-28. Send TD Workshop suggestions to mark@evanstongoclub.org. The World Amateur Go Championship returns to Tokyo this week, after a nine-year hiatus. Sixty three players from around the globe will compete in the 39th edition – known as the Gurunavi Cup – World Amateur Go Championship — May 4-7 at the Nihon Ki-in. Click here to see the full list of players. 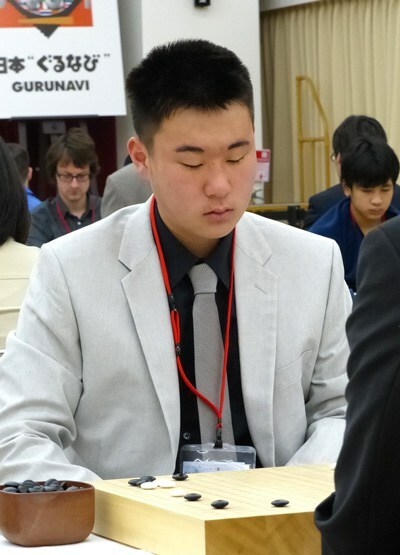 Fifteen-year-old Aaron Ye (right) will represent the U.S., while veteran player Yongfei Ge will play for Canada and Jose Abraham Florencia Islas will represent Mexico. Starting May 4, Ranka online will provide full coverage of the championship. 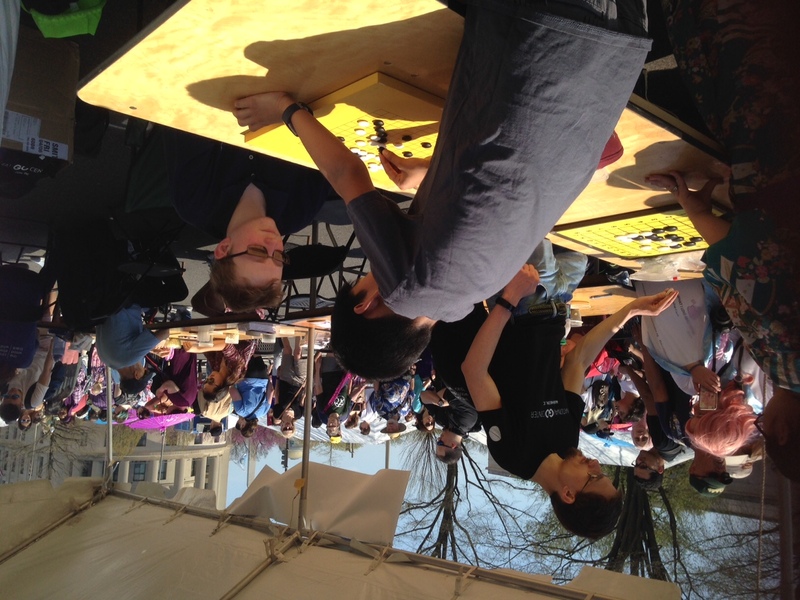 A beautiful day of sunshine and summer-like temperatures pierced the erratic spring weather in Washington DC for the 58th annual Sakura Matsuri street festival last Saturday. 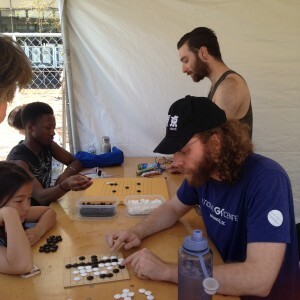 Over 20 volunteers from the National Go Center came out to staff a tent on Pennsylvania Avenue and teach all comers the game. 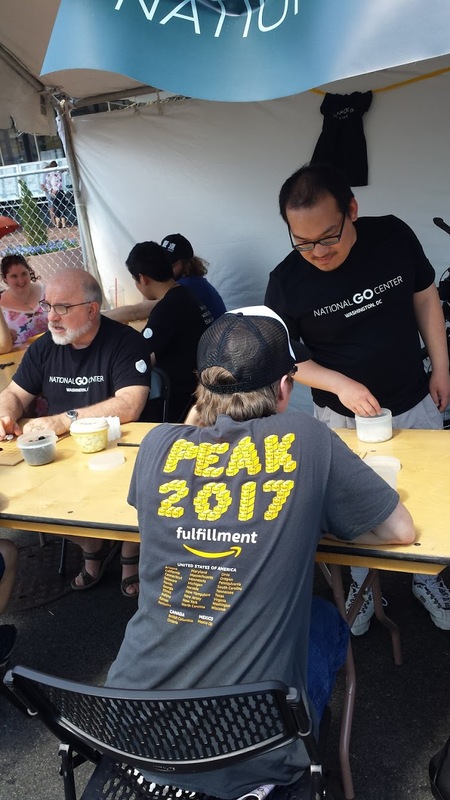 From the time the gates opened after the National Cherry Blossom Festival parade until the early evening, a lively stream of festival goers enjoyed meeting the volunteers and learning about go. 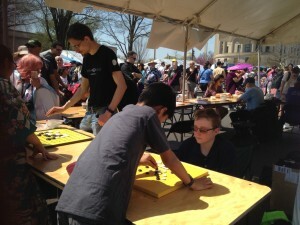 More pictures of the Sakura Matsuri can be found on the NGC Facebook page. 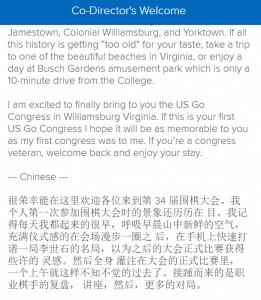 Registration for the US Go Congress is open, and the first-ever Go Congress mobile app for the Go Congress.